Saturday morning was rough. Having lost a battle between myself and a BYO Asian restaurant, the thought of The Blurst of Times that day was making me cringe from my sick bed. However, Coopers Red always comes in handy, and we were off to Fortitude Valley for the second year of the event. Whatever remnants of my hangover that were still “hanging” around (ha ha!) quickly disappeared as Melbourne’s ScotDrakula took to the stage. Their gritty and oh-so-catchy tunes were the perfect way to kick off the afternoon, not to mention their unreal drummer doin’ it for the sisters out there! Following these guys were one of my favourite sets of the day, Many Things. Michael Tomlinson‘s incredible performance as a frontman was one that would have been more suited to a stadium than the Brightside Carpark. Reminiscent of INXS, he climbed on speakers and ran through the crowd, with at least 10 girls (myself included) completely mesmerized. Their set was tight and polished, and showed a LOT of potential. This will be a band we will undoubtedly be hearing a lot of in the near future! The rest of the afternoon consisted of wicked sets from Brisbane’s best in Babaganouj, with their 90’s style rock and angelic vocals from Harriette Pilbeam; Rolls Bayce blowing my socks off with their powerful tunes and raw vocals; and the darlings of Major Leagues with their sun-kissed melodies full of nostalgia and potential of things to come. As I watched Bloods, I was convinced they were my new favourite band, but then I also thought that when I saw TV Colours and the flawless Blank Realm. All three bands provided outstanding sets, and were the names on everyone’s lips for the rest of the evening. I can’t compare them – each band brings something so new and visceral to the game that it’s hard to believe they’re all still relatively “new”. We decided to end the night with a double whammy of Velociraptor and DZ Deathrays. All I really remember from this is a swirl of bodies, beers, screaming, dancing, high fives, and a lot (like, a lot) of other people’s sweat. My bag broke, I got punched in the face and I’m STILL covered in bruises, but it was probably the best 2-and-a-bit hours I’ve had in such a long time. These are two bands who know their crowd, know what they want and aren’t afraid to kick the door in by giving it to you! I’ve said it before and I’ll say it again, there is something about a Brisbane crowd when a Brisbane band plays – the energy and excitement is palpable and contagious, and you have no choice but to join the party! Personal highlight was, and always is, The Mess Up by DZ. The words “death pit” don’t quite portray the carnage that is experienced during this song. 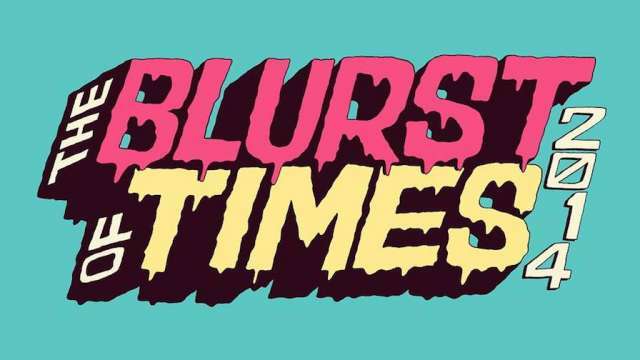 All in all, the team behind The Blurst of Times deserve at least 2 beers each for their work. The lineup was perfectly curated, the stages were great and everything ran as smoothly as things like this could go. I’d be one happy lady if every Saturday was like last!